APLITOP is a company specializing in the design and programming of technical applications for Surveying and Civil Engineering since 2004. 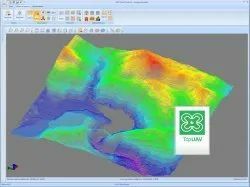 We have developed a broad variety of solutions for field survey and setting out, CAD-based software for civil projects, and special applications for point-clouds, tunnels and photogrammetry. We have more than 10,000 users all over the world, including public administration, universities and training centers, construction companies, engineering and town planning studios, quarries, mines, environmental services, as well as independent professionals. We are leaders in the application of the last technologies and have worldwide collaboration agreements with leading surveying equipment manufactures and CAD systems. The Research and Development projects with several universities and major construction firms guarantee our technical know-how and innovation capacity. Our distribution network, comprising suppliers of surveying instruments and CAD solutions, is an essential part of our marketing policy and we guarantee full technical support and respect for their customers. All-in-one solution for surveying and setting-out linear works with total stations. This field software, installed in the total station itself or in a data collector with Windows operating system, allows the user to survey and set out with a wide range of conventional, motorized or robotic stations, connected through serial cable or Bluetooth. The program has options for all kinds of surveys and stake out (roads, railways, power lines, pipes, etc.). Orthoimages, DXF files or web map services can be used as a base map. You can add to the project horizontal and vertical alignments, profiles, cross sections and superelevations. TcpET has options for staking out by station and displacement, station and code, slope control, and many more. With our technology, geomatics products are obtained from the images taken by drones, and makes stereoscopic restitution very simple.